Create a brand that your ideal customers and employees love. Your brand is why others choose you. What makes you special? We find out and then create a brand strategy that includes the visual elements, the tone of voice, values and the value proposition that will make you irresistible. We will help you uncover your true brand by taking an inside-out approach. The essence of your brand is probably already there. We just have to uncover this essence and communicate it consistently and effectively to your customers. A brand is a feeling. It is something that is desired by your customers. It is built on your reputation and the experience you deliver time and time again. It is the way your receptionist answers the phone, the design of your email footer, your lunch room and car signage, and all the things in between. It is every touch-point that is felt by your customers and employees. It is our passion to create brands that your clients and employees can't help but love. Today your brand needs to be real, authentic, consistent and different. Let us show you how. 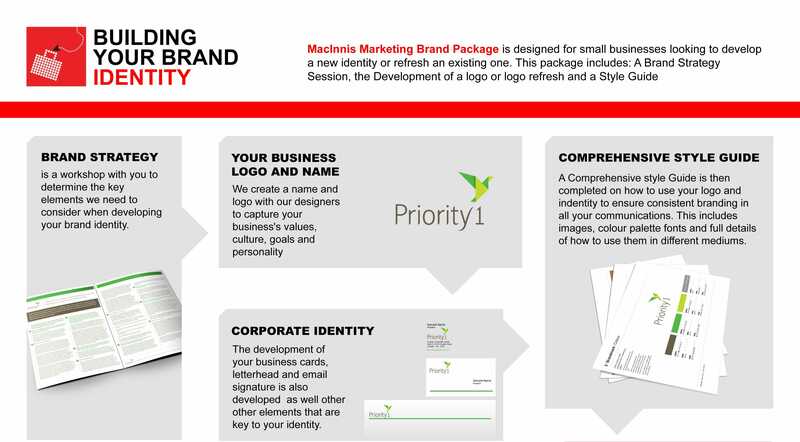 The branding and identity process usually involves a creative team including marketing, copywriting and design. See our process. How good are your marketing materials? Take our audit and see how you compare with an instant report.